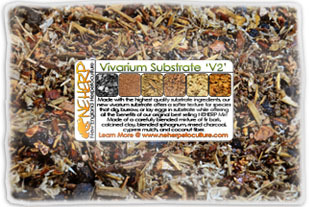 The best vivarium substrate inventory online! 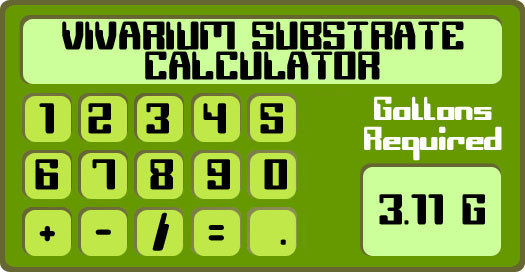 Instantly figure out how much substrate you'll need! Use our substrate calculator to instantly determine exactly how much substrate you'll need to build a vivarium in any rectangular enclosure. The minimum suggested amount of substrate & drainage media is 2.5" (each), but we've also included a spot to add your own custom height, if you'd like to calculate a different substrate depth. Enter your dimensions, and the results will display instantly. Use this chart to determine how many gallons of drainage & vivarium substrate you'll need to make certain depths in your enclosure. 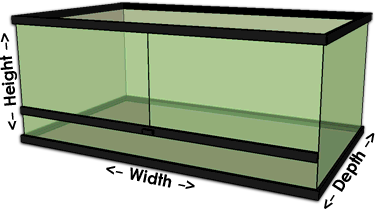 Most vivarium builders recommend at least a 2.5in depth of substrate & drainage layer media (each) for best results. If the above graph is blurry, click/tap here to enlarge in a new window. Our company's reputation was partially formed around our absolute top-quality vivarium substrates which last long term, grow plants beautifully, and support the life of beneficial microfauna. We strongly urge anyone new to the hobby to familiarize themselves with the tangible differences between vivarium advice offered by pet shops, and what you'll experience at a real vivarium specialist shop. The topics of drainage, pH balance, resistance to compacting, and the mix's ability to support flora & microfauna life must all be considered when creating a vivarium substrate. Inappropriate choices (such as coconut fiber, peat, potting soil, or any mix primarily made up of any of those three) will not have the benefits of a real vivarium substrate, and carry risks of their own. Every vivarium substrate we offer is of the absolute highest quality, and have been proven for years to be long-lasting, dependable solutions for the vivarium hobby. 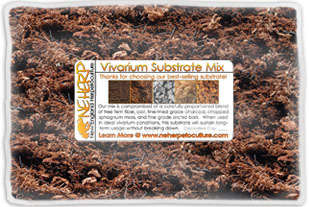 Please check out the Vivarium Substrate section in Vivarium Construction 101 to learn more. The Exo Terra BioDrain terrarium draining mesh is part of the BioDrain terrarium draining system. This non-toxic, non-decomposable mesh will keep the underlying draining substrate separated from the substrate layer above. This mesh is extremely fine (see detail above), and won't allow substrate particles through to the drainage layer below. Comes is four sizes to conveniently fit most Exo Terra enclosures. For 36in + wider enclosures, Exo Terra suggests overlapping two screens. 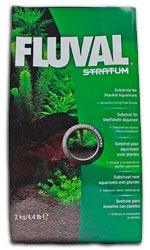 An excellent substrate choice for water features, paludariums, and aquariums. 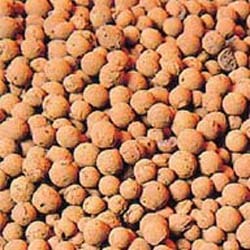 Can be mixed with gravel, stones, and/or riverbed sand for different, natural looking aquatic substrates. Leaf litter plays an important role in a properly built live vivarium environment. To put it simply, this is a consumable product which will be fragmented broken up by agitation, chewing and/or digestion) by the Springtails & Isopods within the substrate layer. Leaf litter will help sustain healthy microfauna populations as well as provide micro nutrients for the plants & beneficial mycorrhizal fungi within the enclosure. Our leaf litter is hand collected & sorted by our long-term contractors for a debris-free product. In addition, we put our leaf litter through an aggressive deep freeze process (-14°f for 48hrs) as an added quality control procedure above the norm. 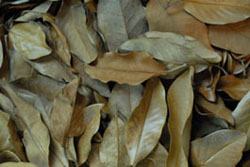 Live Oak leaf litter is probably the most commonly used leaf litter today, since the perfectly sized small leaves resist breaking down while looking great. 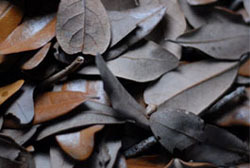 Magnolia is our most inexpensive leaf litter which is most commonly used with larger species like Geckos. Either option provides a long lasting, reliable, and well proven option as a "top layer" over any of our Live Vivarium Substrates. While our leaf litter is hand picked, debris-free, and deep-freezed, it's still a worthwhile practice to process leaf litter before using it in a live environment. The added peace of mind is worth the 5 minute procedure, so please be sure to process leaf litter before use. The process will also make the leaves easier for the Springtails & Isopods to digest! 4) Allow to cool, then strain leaves before use! Our records show that this product has very little or no stock left at the moment, but we're expecting a shipment imminently. If ordered today, we'd expect it to ship within 1-5 business days. Strictly limit 2 gallons per order. The "original" drainage layer substrate for vivariums! It's an inert, PH neutral clay product that holds up long term without breaking the bank. The round shapes maximize surface area between pieces, which supports the important beneficial bacteria growth in live vivariums. Leca allows for proper drainage with minimal 'wicking' in living vivariums which is necessary for the long-term success. Sold in 1-gallon resealable bags. A one-click solution for the "base" of any vivarium! Drainage media, screen separator, substrate, and leaf litter! 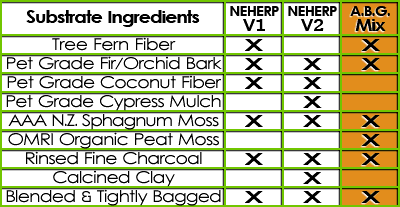 Our NEHERP base kits include all the high quality supplies you'll need to start a live vivarium off right! These are the same high quality NEHERP vivarium Substrates we offer individually, at a package-discounted price. Simply select the type + size terrarium you are working with, and choose your preferred substrate & drainage layer media. 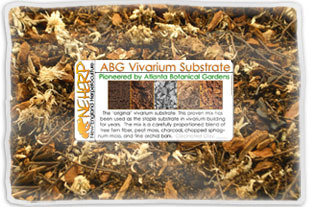 (Differences of each explained on our Vivarium Substrates page) Enough substrate & drainage media is included for an appropriate (2.4-2.6in deep) layer of each. We include a pre-cut screen separator, and enough of our high quality screened leaf litter (assorted) to create a perfectly realistic vivarium. Matching plant kits are available in our plant packages section. 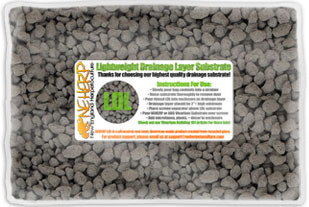 Our best selling drainage layer substrate, our NEHERP LDL (Lightweight Drainage Layer) Substrate is an excellent choice for any live vivarium. Weighing in at under 1.89lbs per gallon, there's an up to 55% weight savings compared to clay aggregate style substrates, without sacrificing surface area or strength! 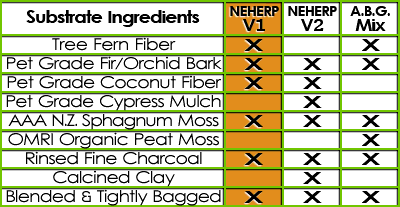 NEHERP LDL is eco friendly, non-toxic, and simple to use. Manufactured from recycled glass with an ideal 3/8"-1/2" average grain size. This product ships at our standard low rates! Need more than 20 gallons? We're glad to wholesale our NEHERP LDL Substrate! Please contact us. We're open & honest about what's in our substrate for a reason. Our ingredients are absolutely top of the line, and we don't skimp on any of the important stuff. We work directly with one of the last tree fern importers in the USA, and even mill our own from time to time to help keep up with demand. Our coconut fiber is sourced directly from a mainstream pet supply brand - not from a horticultural supplier whose less expensive product may have higher salinity. Same goes for the fir bark, which is specifically marked for use with Reptiles & Amphibians. Even the Sphagnum Moss is the same brand we carry separately, which is AAA-Grade New Zealand sourced product. The pre-rinsed charcoal ingredient is a fine-milled natural hardwood product sourced from an American-based manufacturer. If you can think of a way to use higher quality ingredients, we'd sure love to hear how. Available at a discount in our Vivarium Substrate Kits! 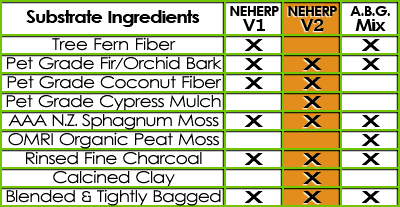 Like all of our NEHERP substrates, this mix includes only the absolute highest-grade ingredients available. The coconut fiber, cypress mulch, and fir bark ingredients are all sourced from a mainstream pet supply brand which specifically manufacturers each for Reptile & Amphibian use. The Sphagnum is AAA-Grade New Zealand sourced product, and both the calcined clay & fine grade charcoal are sourced from a trusted US-based manufacturer. We're really proud of this mix, and we're confident you'll absolutely love it. An easy & inexpensive way to get a type of clay substrate blended into a proven substrate mixture. Some vivarium enthusiasts mix clay & other aggregates into substrates, with the goal being to increase drainage and longevity, and maximize microfauna proliferation in the mix. This material is arcillite; a calcined clay product that's commonly used as a potting soil add-in, and even in egg laying media! Each gallon bag of substrate receives one full cup (8oz) of clay mixture with each purchased amount. This will not break down over time. This product will be mixed-in to the Vivarium Substrate in your purchase before being packaged. Available with NEHERP/ABG substrate purchase only. A simple & easy way to get a non-toxic, evenly cut, screen separator, guaranteed to fit. 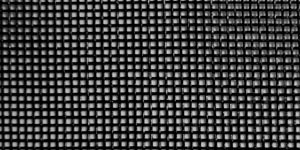 This is the same screen material we've been using since we started building vivariums commercially. Our screen separators prevent substrate from passing through, but allows water to flow freely from substrate layer down to the drainage layer, without any of the water pooling issues sometimes experienced with weedblock or fabric style material. NEHERP Screen Separators are compatible with enclosures by Aqueon®, Marineland®, Tetra®, Exo Terra®, Zoo Med®, and more. If you'd like a custom, large, or uncommon size, please select the "custom" option on the right side, and simply select the corresponding square inch size. These are shipped rolled, so it's easier to lay out & use immediately compared to folded liners. We often give a little extra just to be sure clients have enough, as they are very easily cut with scissors if necessary. Sorry, we're unable to accommodate complex cuts for hex tanks, bow front tanks, cylinders, or anything other than a simple 4-sided shape. If you are working with an oddly-shaped enclosure, we'd suggest purchasing a large enough piece of screen to simply cut down to fit your enclosure. This is the same brand of ultra high quality Sphagnum moss we use in-house. A perfect product for anyone looking for the absolute best Sphagnum around. Our sustainably harvested, AAA-Grade Sphagnum moss has dozens of uses with thousands of different types of plants. 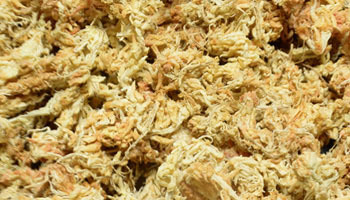 Sphagnum moss is a versatile, long-lasting product renowned for its water holding capacity. Most commonly used by commercial growers and hobbyists for cultivating various orchid species, assisting with the growth of young plants, as a soil additive, and as a decorative enhancement and as a liner for hanging baskets. 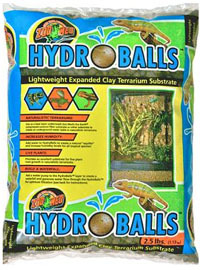 Zoo Med Hydro Balls Expanded Clay Terrarium Substrate is designed for use under the vivarium substrate to create an underground water table in vivariums. An excellent substrate for live plant root growth in planted vivariums. Available in 2.5 lb bags (Roughly one gallon) Basically the same product as LECA, only with slightly smaller, dark gray pieces. Zoo Med Naturalistic Terrarium Mesh is a non-toxic fine mesh for use in terrariums above the drainage layer to allow proper water drainage which keeps substrates from mixing and contaminating the water/filtration system. Specifically designed for Zoo Med Naturalistic enclosures. Everything you need to know to build a beautiful, long lasting live vivarium!